They came from the baby name blog. They’re the quirky girl names 2017! Most parents will stick to the more familiar when naming their daughters. But we discuss a wide range of names here, from the Top Ten to the truly obscure. September means the year is drawing to a close, so let’s take a look at the quirkiest of the names to fare well on this site since the beginning of the year. Possess that elusive quality of quirk! No surprise that Rumi rocketed to the top of the most-read posts lists here at Appellation Mountain after Beyonce and Jay-Z gave the name to one of their twins. The famous family later confirmed that the legendary poet inspired their new daughter’s name. It also brings to mind trending favorites, like Remy, Ruby, and Zuri. Will Rumi follow other celeb names, like Suri and Apple, into obscurity? My guess is that Rumi will catch on. Read more about Rumi here. At first, I mistook Phryne for a tortured respelling of Fern. Instead, Phryne claims Greek roots. It’s pronounced fry-knee, and made famous by Miss Fisher’s Murder Mysteries, the delicious Australian television series starring Essie Davis. Based on the Kerry Greenwood novels, there’s a story behind the 1920s lady detective’s name. Given the success of the series, as well as all of those girls named Zoe, this name could see some use. 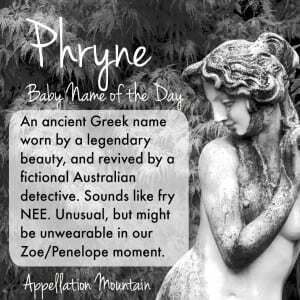 Read more about Phryne here. 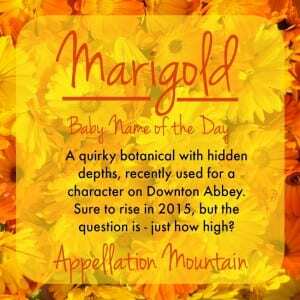 In an age of bold botanicals, Marigold fits in beautifully. And yet, it still makes for a surprising choice. A Downton Abbey daughter boosted this name’s profile. It also has strong spiritual ties, thanks to the name’s origins: Mary’s Gold, often associated with legends about the mother of Jesus. If you’re in love with Daisy and Rose, but want something distinctively different, this name belongs on your shortlist. Night sky names for girls are having a moment, with choices like Luna and Stella on the rise. 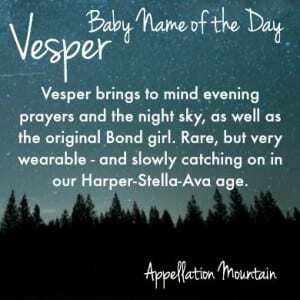 Vesper also fits with all of those r-ending names, like Harper and Piper. And yet, it remains outside the mainstream. Maybe that’s because it started as a Bond girl name. (She’s loosely based on a real-life World War II spy author Ian Fleming admired.) It means evening, and also brings to mind vespers or evensong, a prayer service held at dusk. Read more about Vesper here. Elowen routinely appears on the most popular Appellation Mountain name lists, even though few parents choose it in real life. Still, I understand why it attracts so much attention. The sound is lovely, even haunting. It could shorten to fits-in Ellie, but it comes from Cornish, where it means “elm tree” – and it is as novel in Cornwall as Aspen is in English. Girls alum Zosia Mamet rhymes her name with Sasha, but this Polish nickname for Sophia takes a slightly different vowel sound, closer to an ‘o’ or an ‘aw’ in the original. The name’s rise in use mirrors Mamet’s career, suggesting that most parents probably favor an -asha pronunciation for this name, too. It makes for an intriguing Slavic import boosted by that oh-so-stylish letter Z. Read more about Zosia here. In Dutch and French-speaking countries, Anouk is as familiar as Annie. The Ann- diminutive has a long history of use elsewhere, but in the US, it remains rare. It sounds like ah-NUK, rhymes with Luke. That’s pretty darn quirky. Famous bearers include French actress Anouk Aimee – born Nicole Dreyfus – and Dutch singer Anouk, who uses only her first name. If you’re watching The Girlfriend’s Guide to Divorce, you’ll also know it as the name of free-spirited Phoebe’s daughter. Read more about Anouk here. Alifair is an oddity, tripped over in family trees and historical accounts. During the Hatfield-McCoy feud, a Hatfield daughter by the name died. US Census records turn up many spellings of this name, suggesting it once was far more familiar. It might be cousin to Alfred, Oliver, Alice, or some other name. What we know for sure is that it’s faded from use, but remains an interesting member of the quirky girl names 2017 set. Read more about Alifair here. Beyonce named her firstborn Blue, and names like Indigo – as well colorful choices like Scarlett, Ruby, and Olive – are trending. No surprise, then, that Lazuli debuted in the US data set in 2016, with five girls receiving the name. As for the origins, it comes from the phrase lapis lazuli – a blue gemstone. But in a poetic sense, it can mean stone of the sky or even stone of heaven. Vibrant and meaningful makes for a winning combination. Read more about Lazuli here. Meadow made it into the US Top 1000 after we met television mobster Tony Soprano’s daughter. You can argue that Prairie succeeds for the same reasons – it’s a nature name that feels just right for a daughter. Long-time minor Muppet Prairie Dawn reinforces that idea. In sparing use since the 1970s, Prairie makes a great under-the-radar nature name for parents after something rarer than River or Wren. Read more about Prairie here. Aveline teeters on the very edge of quirky girl names 2017. By 2018, betcha this name will exit the list. That’s because it shares so much with chart-toppers, like Ava and Evelyn. Technically, all three are cousins – though Aveline will probably strike many as an inventive smoosh of the stylish favorites. 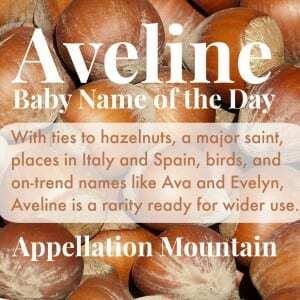 For now, though, Aveline remains an offbeat option for parents hoping for something slightly different. Read more about Aveline here. Evolet fits with so many rare Ev- names on the rise. It was invented for a forgettable movie, but thanks to the Eva-Violet mash-up sound, it might outlast the film. 2008’s 10,000 BC gave the name to the blue-eyed female lead. Word is that her name was based on “the love” – as in the love interest, though the movie suggests it means “the promise of life.” It’s an appealing meaning, an on-trend sound, and an unusual, but very wearable, option. Read more about Evolet here. Many a vintage name on the edge of revival reads quirky at first. Think of Sadie or Hazel or Penelope. Before they hit the Top 100, there was a point where they felt unexpected, even offbeat. Winifred could be poised at that same place now. 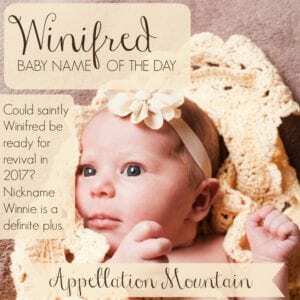 With history galore, easy nickname Winnie, and a familiar-but-rare sound, no doubt Winifred will appeal to many. But for now, the name remains nicely under-the-radar, and yes, a little quirky. Read more about Winifred here. If you’ve seen The Sound of Music – or really, even if you haven’t – you probably know the famous lullaby about the Alpine flower. 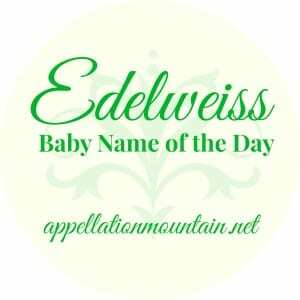 While it was written for the movie, “Edelweiss” is often mistaken for a traditional Austrian folk song. This makes it musical, botanical, and very appropriate for a family with ties to the region. Upbeat nickname Edie is another bonus. Read more about Edelweiss here. Van Morrison’s “Domino” charted in 1970. The song paid homage to the legendary Fats Domino. But something about sounds like it could be a girl’s name. And it sometimes is – Ian Fleming used it as a nickname for Dominique; in the US, girls have received the name in small numbers since 1983, when Fleming’s character appeared in James Bond movie Never Say Never Again. It’s also the name of a French actress and a British bounty hunter played by Keira Knightly in a 2005 movie. I think this one reads quirky – and cool, too. Read more about Domino here. A favorite in Finland, Lumi belongs with nature names like Winter. It means snow. With a sound that brings to mind Luna and Ruby, it’s easy to imagine Lumi fitting in. And given our growing affection for seasonal names, it’s no surprise to find parents seeking the slightly uncommon. Another factor favoring Lumi? It brings to mind the Latin lumen – light. It’s a nice contrast with the wintery name. Read more about Lumi here. Susan and company belong with the traditional choices, names with long histories and plenty of bearers. But Zuzu strikes a different note. This Susan nickname by way of eastern Europe claims one very famous bearer – the youngest daughter in holiday classic It’s a Wonderful Life. There’s a whole backstory to Zuzu’s name. Today it feels like an unconventional way to honor a Susan, or maybe the perfect name for a Christmas-born daughter. Read more about Zuzu here. 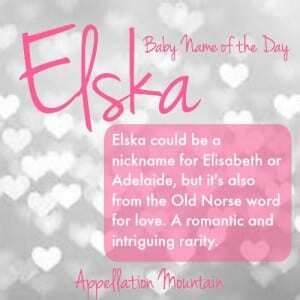 Elska claims ties to Elizabeth and Adelaide, but it likely comes from a different source – an Old Norse word meaning love. If names like Zelda and Lorna appeal to you, Elska’s unexpected sound might prove pleasing, too. It takes Ella and even Elsa up a notch. Plenty of girls’ names with similar meanings have seen some use in recent years, making this a rarity that is worth consideration. Read more about Elska here. Confession: the first Kahlo I met was canine. But it’s a great name for a girl. It fits with fellow o-enders, like Willow and Margot, and K names are considered stylish, from classic Katherine to modern Kylie. 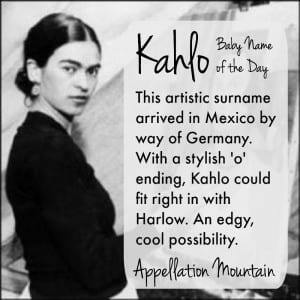 Legendary Mexican artist Frida Kahlo ranks among the best known painters of the twentieth century, and her self-portraits immortalized her unique style. The Victoria & Albert Museum is mounting an exhibit all about her wardrobe in 2018. It makes for a powerfully creative possibility. Take Lola and Lucy and Luna, mix, and you’ll arrive at Lula. But even though this name feels like a modern invention, it qualifies as a genuine vintage pick, popular into the 1910s. With all of the Lu/Lou names making a comeback, surely Lula will join them. Liv Tyler gave the name to her youngest in 2016. Pitbull sings the name in his Spanglish remix of “El Taxi,” too – though that’s not the most G-rated reference. 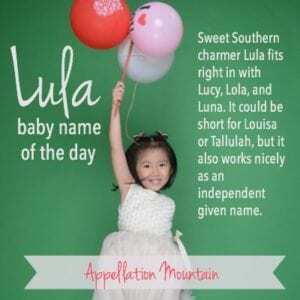 If you love short, retro girl names, Lula makes for a less popular pick than, say, Ava or Daisy. Read more about Lula here. Cricket long served as a sometimes-heard peppy nickname, and very occasionally, as a given name. The Young and the Restless gave us Christine “Cricket” Blair in 1983. In the early 1960s, detective series Hawaiian Eye also included a Cricket, this time short for the equally unusual Chryseis. I’ve found quite a few more, suggesting that this nature name might be more wearable than you might think. Busy Philipps named her younger daughter Cricket Pearl in 2013. It’s retro and modern, a BFF for Lula. Read more about Cricket here. One of the earliest posts at Appellation Mountain, Pomeline appears on the royal family of Monaco’s tree – that’s almost certainly why it stays in the spotlight. This rarity claims medieval Italian roots, and likely connects to the Roman goddess of fruitful abundance, Pomona. That also links the name to the apple – la pomme in French. But while the name continues to intrigue, it remains almost entirely unused in the US and scarcely more popular in modern France. Read more about Pomeline here. A handful of girls – and boys – have been named Swan over the last century or so. But even as avian names like Wren and Hawk gain in use, Swan seems likely to stay in the shadows. It could make a spectacular middle, and modern heroines like Elizabeth Swann keep it on parents’ minds. If you like the graceful, powerful image of the bird, but doubt the name’s wearability, I’ve got a list of names inspired by swans, too. Read more about Swan here. That wraps up my list of quirky girl names 2017! Of all the rarities featured on the site this year, these attracted the most attention. Tell me: do you think any of these might catch on in real life? Could Rumi rocket into the US Top 1000 next year? We named our daughter Isannah in 2014 and she ONLY goes by Zuzu. She’s quite spunky so there’s a good chance she’ll always go by that. We get compliments all the time and it very much suits her. Fun to see it pop up here! This is an odd list for me. Most lists I usually hate or love everything on it. There are some names I wouldn’t touch with a ten foot pole, like Cricket, Zuzu, Domino, or Edelweiss. And there are other names I would be happy to spontaneously adopt a passel of cats just to use the names, like Lumi, Elowen, Elska, Alifair, and Winifred. Elowen is my favourite here. Might Pria work? Spelled Priya, it could make a good cross-cultural nickname for a family with Indian or Nepalese heritage. (Fun Priya fact: from what I understand, Priya is often given to August babies in India and Nepal. It’s also a word traditionally used by the Anangu Pitjantjajara people of Central Australia for a wind that marks the season of Piriya-Piriya or Piriyakut (Roughly August-September). I’ve often thought it could make a really neat choice for a family with Indian and Anangu Pitjantjajara heritage, especially for an August baby. Just waiting for someone with that very specific set of circumstances to ask me for advice 😉 ). 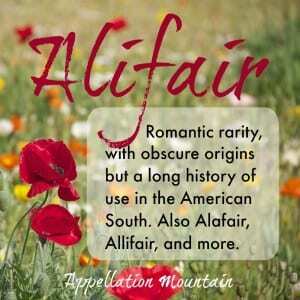 I absolutely love the name ‘Alifair.’ In fact, that’s how I found this website. I was looking for the meaning of the name.